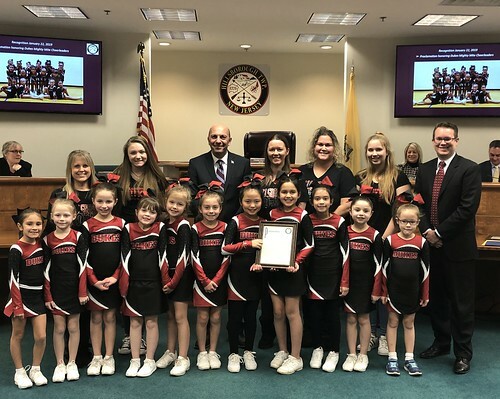 At the January 22nd Township Committee Meeting, the Hillsborough Township Committee recognized the Hillsborough Dukes Mighty Mite Cheerleaders for their successful season and for their hard work, dedication, and commitment to the sport and to those principals of good sportsmanship, teamwork and academic achievement which the organization endorses. The Mighty Mite Cheerleaders won first place at the Jersey Valley Conference competition and received Certificate of Achievement awards for Highest High Stunt Score, Highest High Jump Score, Highest Choreography Score, and Highest Overall Score. The 2018 Hillsborough Dukes Mighty Mite Cheerleaders consisted of the following young athletes: Grace Aull, Abby Churco, Samantha Churco, Liliana Cocuzza, Chloe Cuevas, Lily Cuevas, Daniella Ercolino, Summer Fields, Brianna Heery, Lucia Heiser, Abby Koemple, Bailey McCarthy, Makeyla Murillo, Shalynn Roach and Demi Rott. The squad was led by Head Coach Kelly Heery, Assistant Coach Stephanie Koemple and Student Demonstrators Allison Compell and Ashley Shuttner.